Delhi people love eating. Irrespective of whether it is a party or a business gathering, the spread on the table is amazing. Delhi cuisine comprises all types of dishes. They are primarily regional. This is because people from different states reside in the capital city. As a result of that, restaurants in Delhi serve different types of regional cuisines. Delhi was ruled by many dynasties. And every time the rulers settled here, they introduced different types of cuisine. Delhi was ruled by Afghans, British, Arabs, Rajputs and Mughals etc. Dum Pukht is an important feature of the Awadhi cuisine of Lucknow; meats, herbs and spices are placed in a pot; that is then sealed with dough and slow-cooked over a very low flame. The meat cooks in its own juices, taking on the flavours of the seasoning, and results in a hearty and aromatic dish that is the specialty of the opulent restaurant that shares its name. Recently named the best restaurant in India in the S. Pellegrino and Acqua Panna list of Asia’s fifty best restaurants, Dum Pukht serves its slow-cooked kebabs and biryanis in its extravagant blue-and-silver dining room, complete with crystal chandeliers. Serving the cuisine of the imperial kitchens of the Mughal Empire since 1913, Karim’s is a very popular restaurant in New Delhi that has recently opened up at a number of new locations. Its one hundred year old original premises by the Jama Masjid in Old Delhi, however, remains the top destination for experiencing its renowned local dishes – mutton burra kebabs and the legendary tandoori chicken. A favorite with locals and tourists, the restaurant is a simple, no-frills and authentic dining experience. Housed in a small boutique hotel, Indian Accent is an innovative and unusual restaurant in New Delhi where chef Manish Mehrotra fuses local food with contemporary international cuisine in new and unexpected ways, such as stuffing the North Indian speciality galawat lamb kebab with foie gras and serving it with strawberry and green chilli chutney. Another favourite from the menu is soft-shell crab with roasted coconut and tomato pickle, while their butter chicken is altered with the addition of roast peanuts and peanut butter. Moti Mahal in Daryaganj is one of Delhi’s oldest surviving restaurants. Founded shortly after Indian independence in 1947, it claims to have introduced the recipes for tandoori chicken, butter chicken and burra kebabs to the restaurant scene. It is a great place to sample these north Indian delicacies, and it has remained in its original premises with an internal courtyard and a simple, authentic atmosphere. Moti Mahal has expanded into a global chain with branches in almost every city in India. Right next door to Dum Pukht in the ITC Maurya hotel is another one of S. Pellegrino and Acqua Panna’s 50 best Asian restaurants: the legendary Bukhara. In contrast to the extravagant Dum Pukht, Bukhara serves its internationally-renowned kebabs in a dining room of clay tiles and bare wood, and dishes appear without cutlery but with bibs. It opened in 1977 and has changed little since then; the menu still consists of marinated meats cooked in a tandoor, along with the famous black lentil and tomato dal, simmered for twenty four hours. Punjabi by Nature is another popular restaurant now expanding to multiple locations around Delhi. As the name suggests, it specializes in Punjabi cuisine, with particular favourites including Raan-e-Punjab (lamb’s leg slow-roasted in a tandoor) and black lentils with butter and cream. Most famous of all are Punjabi by Nature’s vodka golgappas: a twist on the popular street snack of puri, chutney, chickpeas, potatoes and onions, with the usual flavoured water in the filling replaced with spiced vodka. Intricately designed to reflect the eastward journey of spices from the Malabar Coast in Kerala, through Sri Lanka, Burma and Thailand to Vietnam, Spice Route in the Imperial Hotel has a menu of corresponding pan-Asian cuisine. Standout options are Thai-style lobster stir fried with ginger and mushrooms, and vermicelli payasam with cashew nuts and raisins. The interior is luxurious, with each of its rooms featuring hand painted murals and artifacts reflecting the many cultures along the route. Dakshin, in the Sheraton New Delhi, serves a wide variety of food from southern India, covering the states of Kerala, Andhra Pradesh, Tamil Nadu and Karnataka and disposing off the Western view that all south Indian cuisine is vegetarian. Instead, Dakshin offers dishes including pan-fried sole, deep-fried prawns, and veinchina mamsam (lamb with onions, coriander, chillies and garam masala). The ingredients and spices for each dish are authentic and sourced from their home regions, and the southern Indian authenticity even extends to the art on the walls. Another of the San Pellegrino and Acqua Panna’s 50 best restaurants in Asia, Varq at the Taj Hotel blends traditional Indian street food with modern expertise and experimentation, set in a sophisticated contemporary dining room. Chef Hemant Oberoi’s new twists on old foods from the subcontinent include syrupy jalebi served with silver leaf and pistachio dip, ganderi chicken kebabs skewered on sugar cane, and atta raan: roast leg of lamb in a saffron dough shell. Park Balluchi’s Hauz Khas premises is located in the middle of Deer Park, affording diners stunning views and opportunities to observe the local wildlife from within the glass-walled restaurant. Park Balluchi’s menu features a wide range of authentic Mughlai and Afghan barbecue dishes, such as murg potli – minced lamb wrapped in marinated chicken breast – and grilled chicken marinated in saffron. For vegetarians, there is mewa paneer tukra: an elaborate dish of paneer stuffed with nuts, dates and raisins. It was the Mughals who introduced tandoor in the country. Tandoor is basically a kind of bread, which is made in an earthen oven. Kababs are quite common in this part of the country. Kababs are small pieces of meat or chicken marinated in different spices. Thereafter, it is cooked over coal tandoor. Many of the most prestigious and highly-regarded restaurants in New Delhi do not, in fact, serve Indian food, with awards lists dominated by Japanese, Italian, French and Chinese restaurants. There remains, however, a thriving scene for Indian food, and worldwide favourites such as tandoori chicken have their origins in the kitchens of New Delhi. 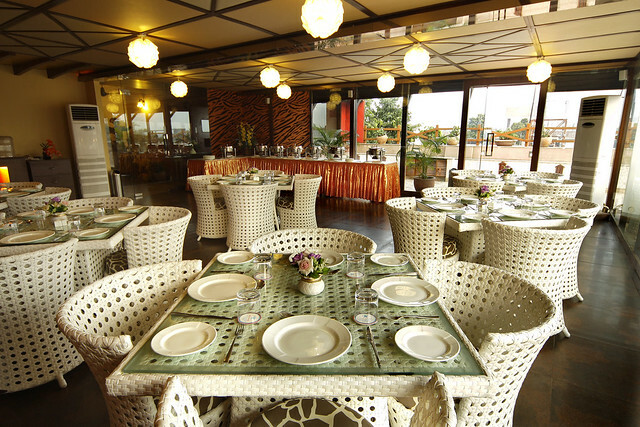 Previous 10 Best Restaurants in Mumbai, #3 is Awesome!